This past weekend I decided it was time for another trip, destination: Seoul for the Lotus Lantern Festival. There was a number of us considering going but as you may or may not know, making plans with big groups is not on my list of enjoyable activities. Rather than trying to coordinate with 10 others I decided to book a hostel with my friend Stephen (whom I hadn't actually hung out with since orientation) and figured I'd meet up with the rest while there. I wanted to catch the bus by 5pm so rather than rely on public transportation I rode my bike to Gumi bus terminal - the ride to Gumi is pretty easy, mostly downhill but I knew come Sunday i'd somewhat regret that decision. Once in Seoul I ran into Beth and Katie and found out they were also staying at the same hostel as me, small world! 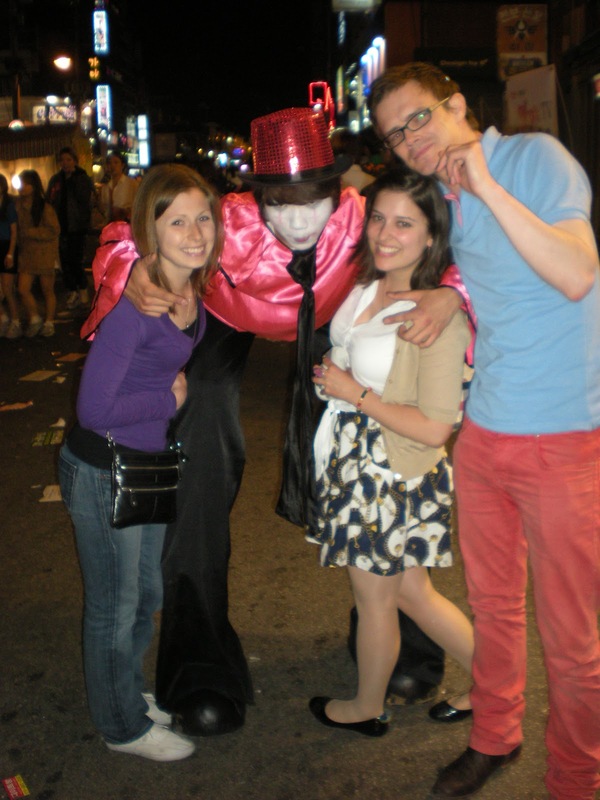 I then found Stephen at the subway station and we made our way to the hostel, dumped our bags and proceeded into the nightlife of Hongdae. This was my second weekend spent on the streets of Hongdae and I can say I've not been disappointed. There's a university nearby so there is plenty of bars, clubs, restaurants and street food. It was one of Stephen's friends birthdays so we started by getting burgers, beer and some unnecessary shots at one o the restaurants. After that we made our way to a few different bars before calling it a night somewhere around 3am. The next day Stephen was a little worse for the wears so I decided to spend the day sightseeing with the girls. We started by making our way to Bongeunsa temple which is on the SE side of Seoul - close to the COEX which is a HUGE department store/shopping mall. The temple was decorated with TONS of lanterns which would be used later that night in the parade. After the temple we met up with Mark and made our way to the Cheonggyecheon stream, a man-made river walk created in 2005 after a 2 year renovation project. The river starts at the Cheonggye Plaza and stretches 5 miles to the east. We entered somewhere in the middle and made our way to the beginning, at which point we realized we'd have to turn around and make our way back to Dongdaemun. We had plenty of time before the festival was to start and it was a beautiful day so this was no problem (for me at least). At this point we had to meet up with Sara (who was at a wedding all day), Darren (who was protesting at some teachers rally - drunk agreement) and Simon (whom I had not yet met). Thanks to our smart phones and subway maps we were able to pic a meeting point, grab some dinner, drinks and then find some spots for the parade. We found a nice little street corner to sit on, cracked some tall boys and waited. The parade started right at 7 o'clock (on time!) and was scheduled to last until 9, although we left around 8 - you can only see so many people and lanterns before they all look the same. Being cold, tired and ready for some drinks we made our way back to Hongdae to change and head out to the bars. The majority of the group seemed to have We also met up with our friend Daniel - one of the teachers from our orientation, which was awesome, so glad he made the trip to see us! We hopped around to a few different bars and ended the night at "Vibe" (?) I think that's what it was called. We lost most of the group by this point, I guess they were looking for the clubs, but Sara, Daniel and I were enjoying our time to catch up. There were also some crazy Belgium and Spanish guys at the bar who were trying to complete the bar challenge - 10 shots in 50 seconds and they're free! So needless to say we were provided with some good entertainment! Sunday was hangover day for the rest of the group - but Sara and I weren't doing to bad so we made our way to Itaewon for an American Brunch. We found Craftworks which is a micro brewery a few friends told me about, thanks for the suggestion Caitlin! Sara had a breakfast burrito and I went with the scrambler = one of my favorites, unless i'm in sweets mode then it's french toast! They also had bloodies there but we decided we'd had enough alcohol for the weekend - now I need to go back. After brunch we wandered around Itaewon (foreigner district) found a cute used book store, and spontaneously decided to get some pedicures - great decision, my feet thanked me. We got to the bus terminal about 3 o'clock expecting there to be a 3:30 bus back to Gumi, but no, we were wrong - next bus was at 4:50. Annoying, but not the end of the world, we found another book store to wander around, bought some snacks and boarded the bus. I was almost positive i'd opt to leave my bike at the bus terminal and take a bus home, but I sucked it up and rode it home. Uphill, twilight, after a lack-of-sleep weekend in Seoul, not exactly fun, but glad I did it. The next few weekends I have tentative plans for some travels to the southern shores of Korea (and Dad comes in two weeks!!) so check back soon. It's also a busy time at school, we have the School Festival tomorrow, i'm not sure exactly what that entails but it sounds like a big party! So when I was about half way through this blog entry i was beginning to assume that koreans dont get hammered like wisconsinites until i read the 10 shots in 50 seconds...that immediately made me think of something drunk people would do at cocos. i know you could vouch for that. I Get Paid for This?! ?